This stuff right here is what dreams are made up of. 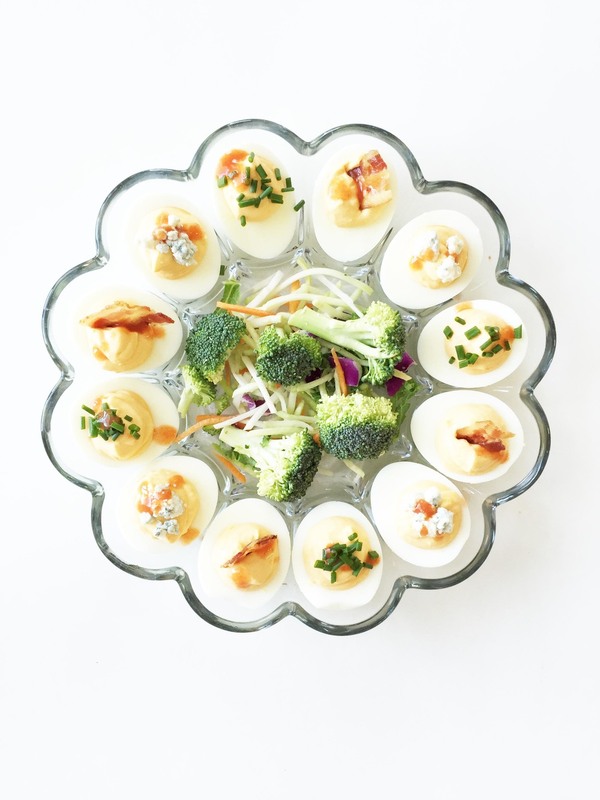 I've a southern girl, so deviled eggs are a staple to any holiday or 'special event'. Instead of the same ole' same ole', I love to play around with different combinations. My last adventure with deviled eggs was quite a big hit, so I decided to try my hand at it again. This time though, I wanted to make my deviled eggs 'game day friendly'. How do you make something more game-day inspired than to throw buffalo sauce at it and call it a day? Plus, their orange and white just like the colors of my favorite local college football team. Hook'em! Yes, I'm still a Longhorn fanatic even after my brother graduated UT this past may. That's just what you do here in Austin; you be weird and you love your Longhorns. These deviled eggs are full of that traditional 'buffalo chicken' flavor that we all know and love. Plus, the heat off the buffalo sauce is tamed down with the cool richness of the blue cheese. Yum! They are sure to be a hit at your next game-day event. Though, they would also rock out for tailgating too, just be sure you keep them cooled! Not only did I give the amazing recipe for these bad boys below, I also gave my easy way of hard-boiling eggs perfectly! It's a fail proof way that I've come to use that keeps the yolks nice and golden without being overcooked or giving you that yucky dark drink around the yolks. I plan for these to be my snack and part of my lunch for this week. I'll serve them with a chopped broccoli, kale and mixed blend salad with a light blue cheese dressing. Easy, delicious, and so crave-able! Place the eggs direction in a large pot and cover with 1" of water; bring a large pot of water to a boil over high heat. Turn the heat off, cover the pot and allow to sit for 12 minutes. While the eggs are cooking, prepare an ice bath with a large bowl, cold water, and some ice cubes. Once the eggs are done, drain them and remove the eggs to place into the ice bath to stop the cooking process. Allow the eggs to chill out in the ice bath for 5-10 minutes. Crack the eggs gently and peel to remove the shells; set aside. Cut the eggs carefully in half and pop out the cooked yolks, transferring them to a medium bowl. Add the yogurt, blue cheese dressing, buffalo sauce, and mayonnaise to the bowl and mix until smooth and creamy; season with salt & pepper to taste. Fill the emptied egg whites with the mixture. I like to place the deviled mixture into a ziplock, seal, and snip off the corner to do this - similar to what I do for piping frosting onto my cupcakes. Once done, top accordingly with the bacon, bleu cheese, chives, or a dollop more of the buffalo sauce. Serve right away or cover lightly and store in the fridge until ready to eat!